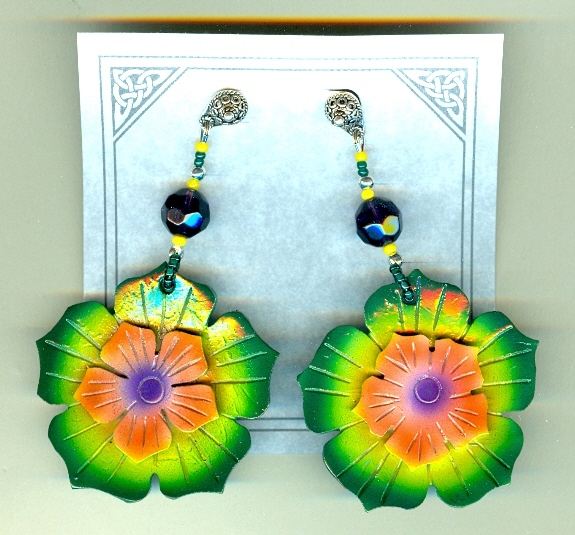 The fronts of these lightweight, large earrings have been painted in shades of emerald, peridot, violet and sunset orange. They've been painstakingly carved into stylised petals. The backs of the flowers are curved and perfectly smooth for comfortable wearing. They're made of lightweight coconut shell, and are a generous 50mm (about 2 inches) in diameter. With the addition of the large amethyst crystal bead, each earring dangles about 3-1/2 inches from the top of its ornate sterling silver post finding to the bottom of the hibiscus. A lady could be anywhere in the world and still have the tropics in her heart wearing earrings like these! We're having a tropical heatwave here at SPARKLE PLENTY.